Couchella… Wait I mean “Coachella” ! 1. Open Facebook. Scroll. View pictures of Drake at #coachella. 2. Open Instagram. Scroll. View #coachella hashtag. 3. Open Snapchat. Watch “Coachella” Story. 4. Open YouTube. Livesteam “Coachella”. 5. Open Twitter. Read about how awesome #coachella is. Retweet. … Ahhh, the power of social media. It’s like you were right there the whole time! I don’t know about you, but Coachella has been absolutely flooding my feeds this weekend!! But, I actually don’t mind. It’s clear that the festival has a very strong digital strategy, as they are truly covering all bases when it comes to the social media world. You name it, they’ve got it covered. On all social media platforms run by Coachella – I’m talking every couple of hours. The content that is shared is very visual; strong use of both photos and videos which in turn receive a higher level of engagement from fans and other social media users. Granted, “Coachella” is quite photogenic, haha, the use of visuals of to: build excitement before performances, disseminate festival info, capture moments as they occur during the event, and post photos after the event. Using an Official Event Hashtag allows festival goers (and non festival goers) to engage in conversation, share their posts with the Coachella community and to associate with the festival in an indirect way. 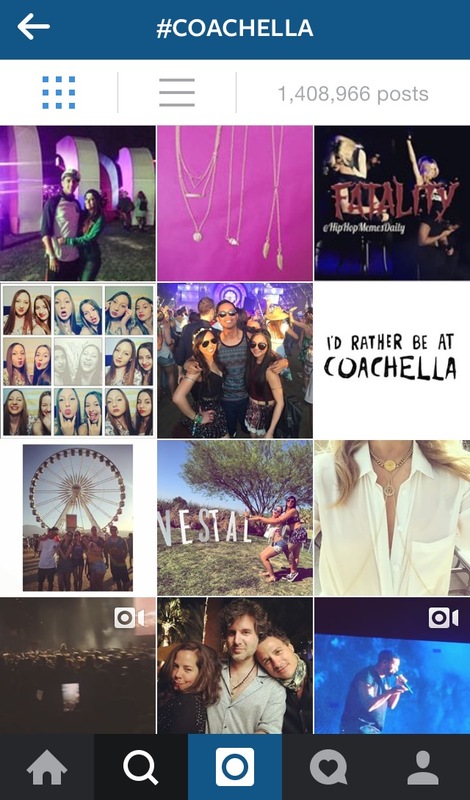 It’s also a great way to expand their audience and create a search term which allows the #Coachella conversation to be optimised, increasing SEO and social media presence.The Coachella hashtag, on Instagram alone, has over 1 million posts! In my eyes, Coachella are doing digital marketing the right way. They are engaging with both current and future customers by creating a “hype” or a “buzz” on social media, using a variety of platforms in creative ways. Seeing all the photos makes me want to be there! Which, I’m sure, is exactly the effect they are hoping to have! What are your views on following a festival via social media? Do you think that it has the ability to alienate the dedicated festival-goers? This entry was posted in Digital Marketing and tagged Coachella, digital marketing, hashtags, social media, strategy by kylahblogs. Bookmark the permalink. They definitely aren’t going wrong at all with the marketing of this festival! They legit are making sure no one misses out on knowing that it’s happening. They are dominating all social media sites! Coachella, and all other festivals present on social media do such a great job of creating hype! I watched the live footage of Coachella through the snap chat story and it felt like I was really there! Having the ability to watch live footage from the audiences point of view rather than promotional photos from the festival itself is a lot more effective as it allows you to experience the ‘vibes’! Great post I think Coachella is a perfect example of brands using social media platforms to engage successfully. I loved the Snapchat story too! I think Snapchat is such a cool social media tool for brands like Coachella. Ooh I did my post on Coachella too and I agree with everything you have said! Their digital strategy this year is amazing. Any online place you go – they are there catching everyone’s attention. Just read your post! Definitely, when I was researching their strategy I came across some write-ups from previous years. It seems that as new technology comes out, they jump on it and incorporate it into their strategy! Great to see brands that stay on top of social trends. Absolutely! They’re staying on top of the game. I have never been so upset not to be somewhere else then when Coachella was marketing on social media! I have to say it was the snapchat stories that got me, watching those everyday have got me wanting to plan my next trip there!! Totally agree, they got me as well!